Regulators in Chengdu, capital of Southwest China's Sichuan Province, rolled out the country's first regulation on bike-sharing industry on Friday, and experts predicted the move will be followed by more local governments this year despite certain policy difficulties. The trial document stipulates that all Chengdu residents, not just the service users, are obliged to protect public and private properties such as shared bikes and parking facilities. Those who deliberately destroy or steal the vehicles will be investigated and punished in accordance with law. People whose behavior is serious enough to constitute a crime shall be prosecuted for criminal liability, the guidelines noted. 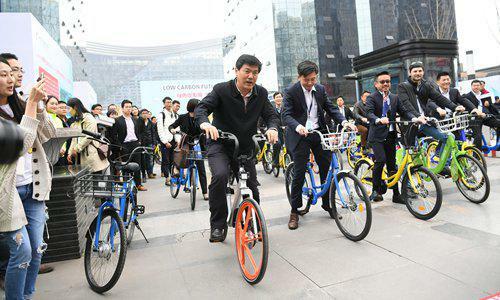 Meng Changhui, an analyst with Beijing-based CCID Consulting, said that the new rules reflect the government's supportive attitude on China's booming bike-sharing sector and will create a positive judicial environment for the industry. In addition to Chengdu, Beijing will also draft a regulation on the bike-sharing industry by the end of 2017, the Beijing-based newspaper Legal Mirror reported Friday. Meng said that more local governments will roll out regulations for the industry in 2017. "For bike-sharing sector, there are not so many conflicts of interest among different groups as in the ride-hailing industry, so the process of assessing the impact on various groups and drawing out policies will be a lot easier for the government," Meng told the Global Times on Friday. Meanwhile, experts pointed out that some areas in the industry are hard to supervise. The companies' management of deposits worth billions of yuan is a problem, Meng said. Currently, each user needs to pay a deposit ranging from 99 yuan ($14.3) to 299 yuan before using the service. Besides, "although measures outlined in the guidelines can curb violation of law, other conducts such as keeping the shared bicycles as a personal belonging are still rampant," Meng pointed out. It is estimated that the number of bike-sharing users will reach 50 million in 2017, news portal sina.com reported in February.